Add a little more boisterousness to your Chinese New Year gatherings with friends and families with something special that Diageo Malaysia has to offer. From limited editions to top casks the best brands have to offer, they can be great gifts for the festivities, or something to share amongst your loved ones as you usher in the Lunar New Year. 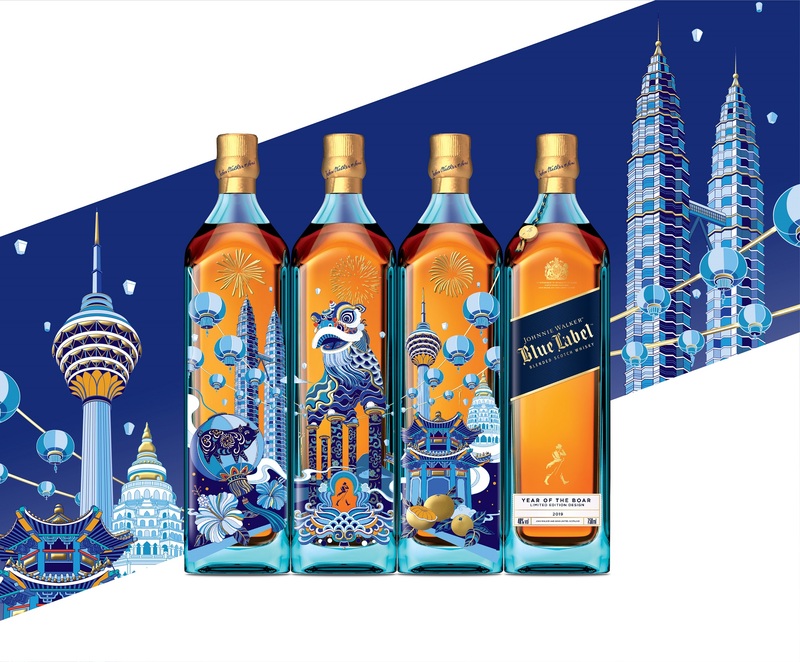 Celebrating the momentous occasion of the Chinese community is the Johnnie Walker Blue Label Pioneering Cities Limited Edition, featuring a bottle design by Rion Wang – the latest addition to the Johnnie Walker Blue Label Pioneering Cities series. Wang brings alive the spirit of the Malaysian Chinese community when it comes to keeping the traditions in celebrating the Year of the Boar. With slight influence of the western contemporary, artistry and sophistication, the special artwork also pays tribute to the rich Malaysian culture and history, featuring iconic Malaysian landmarks, and the country’s renowned flora and fauna. Selected from 1 in 10,000 casks, the Johnnie Walker Blue Label Pioneering Cities Limited Edition stays true to its 200-year-old blending heritage, crafted with the rarest of whiskies across Scotland, known to some as smooth, while others, complex and intense. Another number of The Striding Man one could turn to to ring in the Lunar New Year is the eye-catching limited edition bottle of Johnnie Walker Gold Label Reserve. The iconic Johnnie Walker square bottle is coated in a beautiful gold lacquer to create a striking ‘gold bullion’ effect. The striking metallic bottle emphasises the gold-standard craft and ‘golden whiskies’ that went into creating this blend, and the special moments that Johnnie Walker Gold Label Reserve is made to celebrate. Boasting notes of vanilla and dark fruit, with just a hint of smouldering embers from the West Coast, the special edition is packaged in a cream and golden box that comes with a little something extra on the inside: a golden flask any whisky enthusiast would love to have to fill to the brim with this luxurious and smooth whisky. Got a feeling that the Year of the Pig is the year when everything will happen? Even if it’s a gifting gesture to usher in a prosperous year, the Exclusive Edition John Walker & Sons XR 21 Ru Yi Pack might just catch the attention of the God of Wealth to come your way. “Ru Yi” (如意) is a symbol of power and good fortune in Chinese folklore, and is apt with the auspicious Chinese New Year celebration, when it comes to bringing wealth to all those who possess extra rare qualities, just as the blend is crafted on rarity. Through layers of gold in this smooth and luxurious whisky made from Johnnie Walker’s reserve whiskies, all aged for a minimum of 21 years using a three-step blending process, the XR 21 possesses flavours of sweet honey and tempered spices, leaving a long, smooth and soothing finish that is complex and fascinating to the taste palate. Reunion dinners getting a bit blend for your taste? Don’t tell your mom (lest she disowns you), but instead, come home with The Singleton of Glen Ord limited edition festive pack, Malaysia’s favourite single malt whisky that might just give the dinner that extra kick. Slow batch distilled for a complex character, The Singleton of Glen Ord 12 Years Old is light and smooth, without compromising any depth of flavour or fullness of taste palate. This amber liquid possesses perfectly balanced taste notes of apple, prune and cinnamon, and is best served neat or with a drop of water, perhaps even as a cocktail or dark chocolate after dinner.